Perfectly balanced levels, especially in interaction with other Synchron Series libraries, such as Synchron Strings I, SYNCHRON-ized Chamber and Appassionata Strings, etc. The string players of SYNCHRON-ized Dimension Strings I were recorded in homogeneous groups, capturing all of the human interactions and slight imperfections of a live performance. Individual microphones for each player allow you to access each voice of the ensemble separately. Making use of the new Synchron Player, SYNCHRON-ized Dimension Strings I offers a wide variety of articulations, organized in the player’s clearly laid out structure, and is therefore easy to navigate and to play. 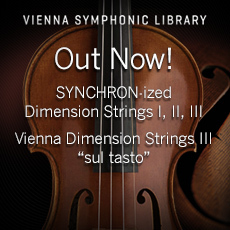 The complete sample database of the original Vienna Dimension Strings has been meticulously quality controlled, with many minor and major improvements applied along the way, e.g., for legatos and portamentos. The new and advanced release sample technology shows off its sonic benefits particularly in the legato repetitions and the dynamic patches, such as fortepiano, sforzato and sforzatissimo. The Vienna Synchron Player comes with a convolution engine derived from Vienna MIR Pro, featuring the outstanding and unique ambience of the 540 m² (5,813 sq.ft.) main hall of Synchron Stage Vienna. The perfectly engineered reverberation and placement presets combine customized impulse responses with expertly crafted reverb settings not only for each group of the ensemble, but also for each individual musician of each ensemble.